Abstract: In general we found that the MSI P965 Platinum motherboard performed very well in practically all the benchmarks tossed its way. Quake 4 is the latest shooter from ID and is based on the Doom 3 engine. Tweaked to for more eye candy, Quake 4 promises to be tougher on videocards and systems than its predecessor was. Quake 4 also does not have a 60 fps limiter like Doom 3, with the Ultra setting, graphic textures can surpass the 500MB mark! Each test is run three times and with the third run being recorded. In the final test of the day the MSI P965 Platinum performs very well in Quake 4. Gamers will definitely be pleased with the performance of this MSI Motherboard... or any other P965 or 975X board for that matter. Conclusions: P965 and Core 2 Duo Processor - better than 975X? Intel has put itself in a little bit of a bind, its P965 Express chipset is not only just as fast as the high end 975X Express, it's also paired with a more advanced Southbridge and costs less! Talk about a win win situation for consumers, well apart from the IDE issue. Whatever the case, there is a literal flood of P965 Express based motherboards to choose from right now - indicating that the Intel Core 2 Duo is a very strong processor for the moment. The MSI Computer P965 Platinum motherboard is certainly worthy of your attention if you plan on upgrading an Intel-based PC anytime soon. With a price tag that won't break the bank, $154 CDN ($135 US, £68 GBP), the MSI P965 Platinum motherboard is aggressively positioned considering what's included in the package. 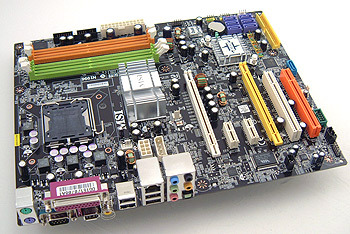 From Gigabit networking to IEEE 1394a, 7.1 channel Intel Azalia High Definition Audio and 7 Serial ATA II ports, this socket 775 Intel motherboard has a lot of value. To make things even sweeter, the MSI P965 Platinum overclocked to a very respectable 375 MHz FSB. Overall the MSI P965 Platinum motherboard is extremely easy to work, has a good level of expansion options, and performed well in the benchmarks with a single PCI Express x16 videocard. Crossfire's an option too, but with the results we've already seen from a Core 2 Duo E6600 based computer, I'm not sure the Crossfire cost is really worth it here. Particularly since the second PCI Express x16 slot is a PCI-e Lite slot with 4 PCI Express lanes to its name. Although to be fair, since PCSTATS didn't test Crossfire we'll reserve our comments on that front. In general we found that the MSI P965 Platinum motherboard performed very well in practically all the benchmarks tossed its way. Most if not all Core 2 Duo motherboards are in a similar position, so whether you're building a work computer, or a gaming computer, the MSI P965 Platinum is a solid foundation. There was a slight blip in FarCry numbers, but all other tests came in as expected. There hasn't been a better time for Intel users to upgrade, and if you get a MSI P965 Platinum you'll certainly be satisfied. It's fast, well equipped and exactly what Santa should put under the XMas tree.